As air travel was a budding mode of transport, weaponry, and more old time radio shows reflected Americans interest in all things air travel. Old time radio shows about pilots, airplane, air adventures, and more were pulled from comic strips, pulp fiction, as well as real accounts of pilot's stories of their air escapades. This collection includes rare, hard to find aviation themed old time radio shows. Flying Hutchinsons - This show was originally called "The Flying Family" and was based on the true life exploits of the adventurous family which included Col. George Hutchinson, Blanche, kids Kathryn and Janet, and their pet lion cub named Sunshine. Howard Hughes Hearings - Senate War Investigating Committee tried millionaire Howard Hughes for a misuse of government funds to build an airplane nicknamed the "Spruce Goose." Howie Wing - This late 1930s radio adventure series included 21 year old Junior Pilot Howie who is joined by WWI Ace Captain Harvey, Howie's girlfriend Donna Cavendish and the cankerous "Zero" Smith. 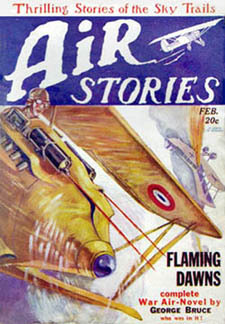 George Bruce Air Stories of the World War- George Bruce was a pioneer fighter pilot during the first world war. He penned his way in the the pulp fiction hearts of young 1930s adventurous Americans everywhere. Sky Blazer - Produced by Phillips H. Lord of Gangbusters, this old time radio show chronicled the early trailblazers of the sky who made aviation what it is today. Sky King - Combination Western and Aviation adventure show with Rancher Sky King, his niece Penny, and their airplane Songbird. 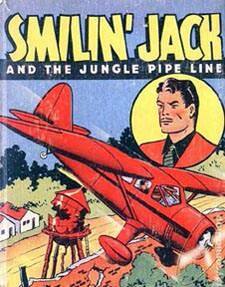 Smilin Jack - Based on loved comic strip by Zack Mosley which had a 50 year run, Smilin Jack is joined by Flight Attendant Dixie Lee and Hillbilly Rufus. The comic strip lasted decades, but unfortunately the radio show only lasted one year. Tailspin Tommy - previously created as a movie serial and comic book, Tailspin Tommy saves lives and fights for goodness and humanity around the world in this old time radio adventure series. The Sparrow and the Hawk - Post war adventure serial with It recounted the wild, blue yonder adventures uncle (Hawk) and nephew (sparrow) team of thrill seekers. 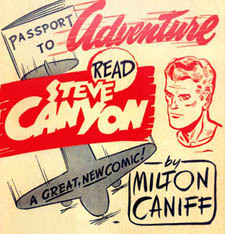 Steve Canyon - Based on a comic strip by Milton Caniff of Terry and the Pirates fame, Steve Canyon features USAF Lieutenant Colonel Steve Canyon and his team of pilots at Big Thunder Air Force Base. Uncle Neds Squadron - An education air adventure show hosted by pilot, flight instructor, and middle school teacher Norbert "Ned" Locke. For other aviation adventure series, see also: Air Adventures of Jimmy Allen, Airplanes and Pilots in Old Time Radio, Anne of the Airlines, Air Stories of the World War, Captain Midnight, Hop Harrigan, Howie Wing, A Saga of Aviation, Rare Aviation Old Time Radio Shows, Airmail Mystery, Sky King, Speed Gibson, Tailspin Tommy, Terry & the Pirates, Sky King, Sky Blazers, Charles Lindbergh Recordings, Amelia Earhart, and Smilin' Jack. Be the first to comment on "Rare Aviation Old Time Radio Shows"